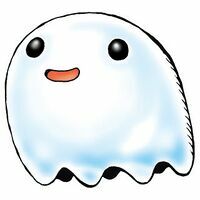 With a translucent body, it is a Digimon Baby that drifts through the "Net Ocean" like a jellyfish. As it has the most primitive structure among the Digimon discovered to date, it has been showered in attention as the "Missing Link", the key to solving the mystery of the origin of Digimon, by the scholars and enthusiasts studying the roots of Digimon. In order to defend itself from intruders it spews potently acidic bubbles out of its mouth. — Digimon Adventure: "Departure - to a New Continent!" Comes from Poyopoyo (「ポヨポヨ」), which describes children toddling around. Anime/Manga Digimon Adventure: "Adventure! 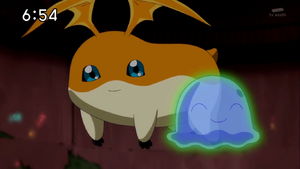 Patamon and I"
3.1.5 Digimon Frontier: Revival of the Ancient Digimon!! Awa  Bubbles アワ N/A Bubbles Shoots bubble-like substances from its mouth. Kyouryokuna San no Awa  Powerful Acid Bubbles 強力な酸の泡 N/A Super Bubble Blow Shoots powerful acidic bubbles from its mouth. San no Awa  Acid Bubbles 酸の泡 N/A Frothy Spit Shoots slightly acidic bubbles from its mouth. Poyomon is the partner of Takaishi Takeru. After Angemon sacrificed himself to defeat Devimon, Patamon's data was reconfigured into a DigiTama. As the Chosen Children departed for Server Continent, the DigiTama hatched into Poyomon. A Poyomon is the only Digimon kind to Ichijouji Ken when he comes looking for Wormmon at the Village of Beginnings. It is seen with an Elecmon and other Baby Digimon in a forest as Black War Greymon passes by. Later in the series, a Poyomon becomes the partner of a child who was previously infected with the Dark Seed. Poyomon are seen at the Flame Terminal, the Great Trailmon Race, and the Village of Beginnings. Several Poyomon are among the Baby Digimon on the Human side. A Poyomon was among the Digimon caught in the vortex that appeared when humans were deleting Digimon. Poyomon is an obtainable Digimon in Digimon World. Once your Digimon fades away, it will be reborn into one of the four Digitama Jijimon offers to you. If the yellow-stripped Digitama is chosen, Poyomon will hatch out of the Digitama. A Poyomon NPC is found living in the Village of Beginnings inside Jijimon's house, offering advice to beginners, primarily on evolving your Digimon, as he only tells you about reaching the Baby I, Baby II, Child and Adult levels as he doesn't know how to reach the Perfect level yet until the game progresses. Once the Player has recruited Agumon and opened an Item Bank, Poyomon will move and live there. Poyomon evolves into Tokomon after 6 in-game hours have passed, with no necessary conditions required. 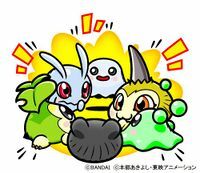 Botamon, Punimon, Poyomon and Yuramon all appear on the Regression (退化 Taika) options card. Can be found at Data Forest. It can evolve into Gomamon if above level 9, Ganimon if above level 15 and Defense above 70, or Kamemon if above level 22 and Water EXP above 1000. Can be found at Loop Swamp. Can evolve to Kamemon if above level 9, or Gomamon if above level 11 and Water EXP 100, or Ganimon if above level 16 and defense 75. Can evolve to Tokomon, Mochimon, Pukamon or Nyaromon. Poyomon is an obtainable Digimon which is hatched from the purple DigiTama, and evolves into Tokomon. It can also be obtained as a collectible card. 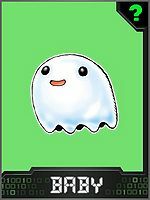 Its card is part of the Cute Children (かわいい子供たち Kawaī Kodomotachi) set. To obtain avatar part 4 in Chapter 1 you have to battle a Poyomon and a Tsunomon. ↑ Digimon Adventure: "Departure - to a New Continent!" ↑ Digimon Adventure: "Etemon! The Stage Mounting of Evil"
This page was last modified on 22 March 2019, at 20:28.